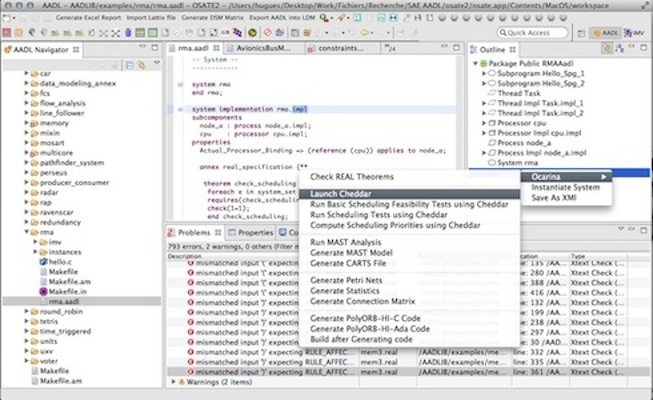 The OSATE2-Ocarina plugin brings all Ocarina’s features to OSATE2: code generation, generation of Petri nets, mapping of AADL models to scheduling analysis tools, and constraint analysis using REAL. The plugin can be configured from the OSATE2 Preferences panel. The plug-in preferences are located under OSATE Preferences/Ocarina. Note: The plugin requires an external installation of Ocarina. Simply pass the full path to Ocarina /bin directory. Right-click a system implementation in the Outline, then select Ocarina, and then the command to execute. The output of the command (generated source code, etc.) is stored in the ocarina_out folder in your project.